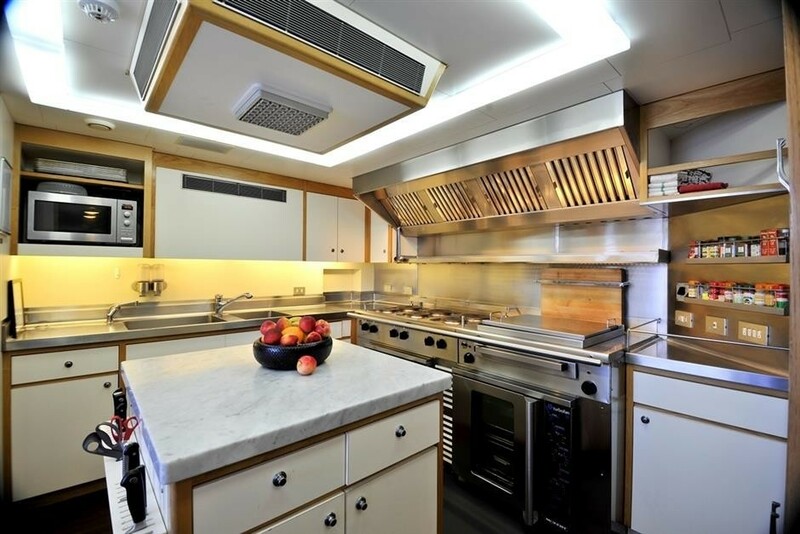 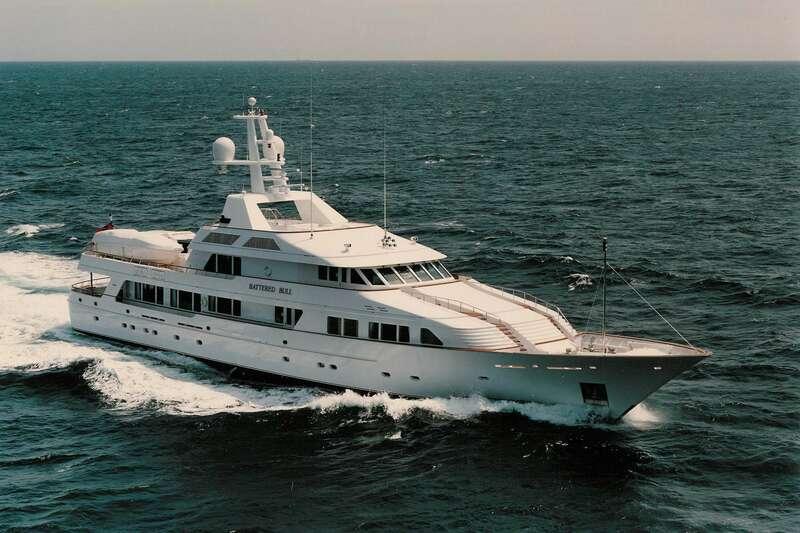 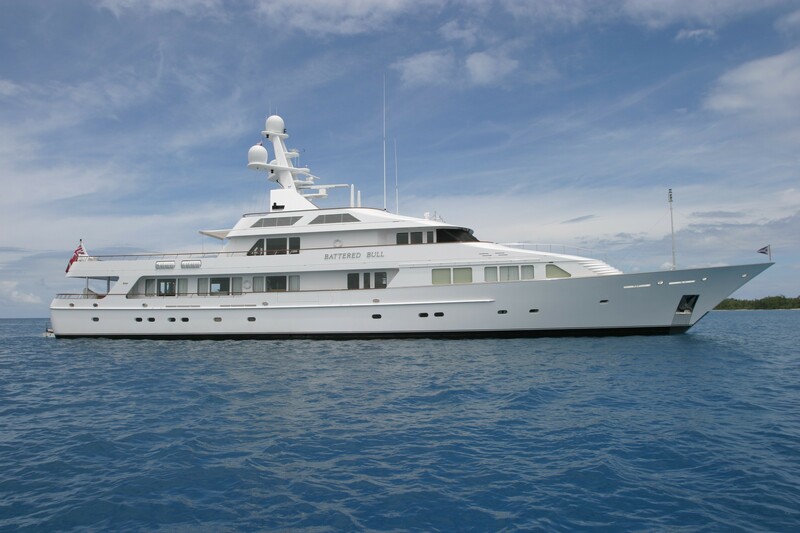 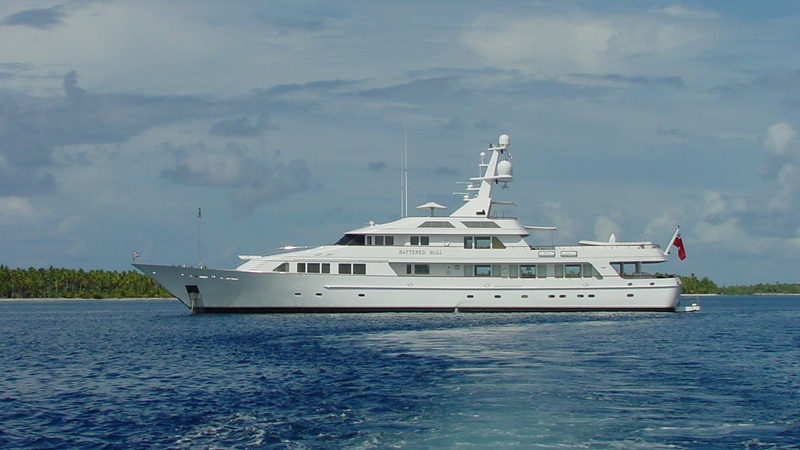 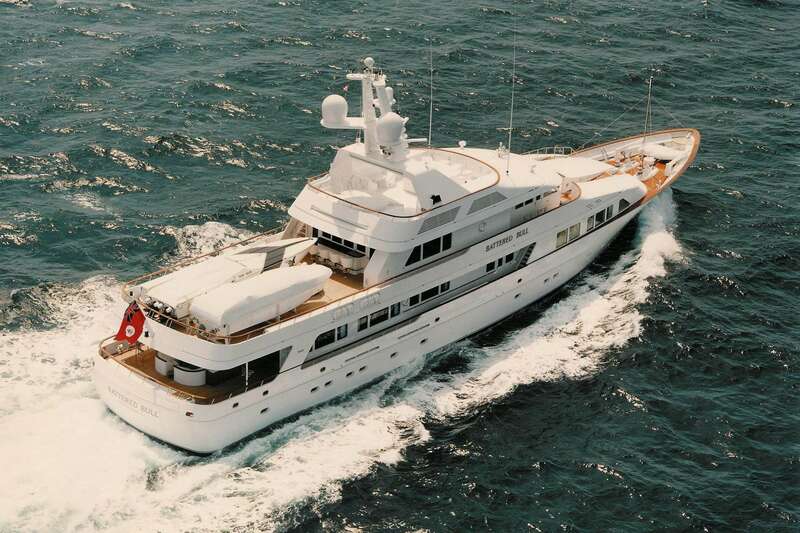 Feadship Yacht MARIA offers a unique and versatile layout which describes both interior and exterior features. 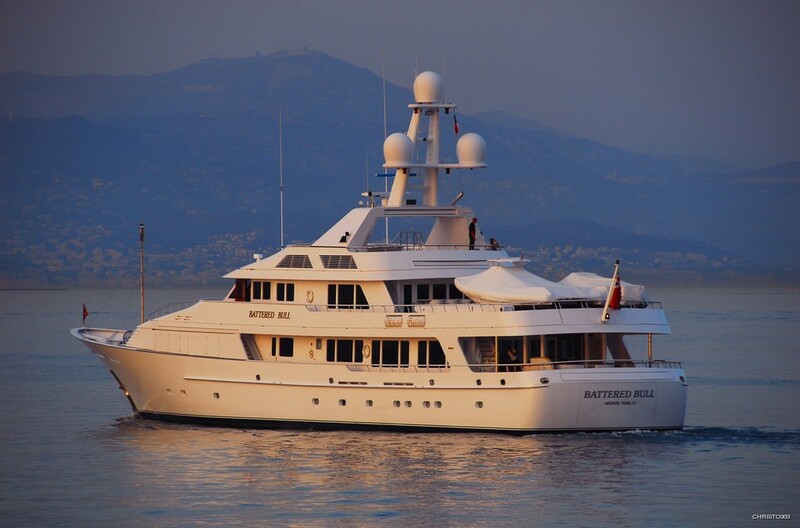 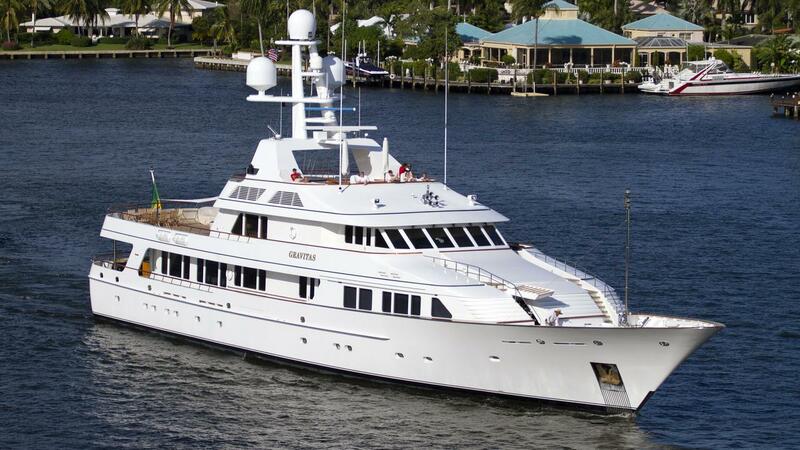 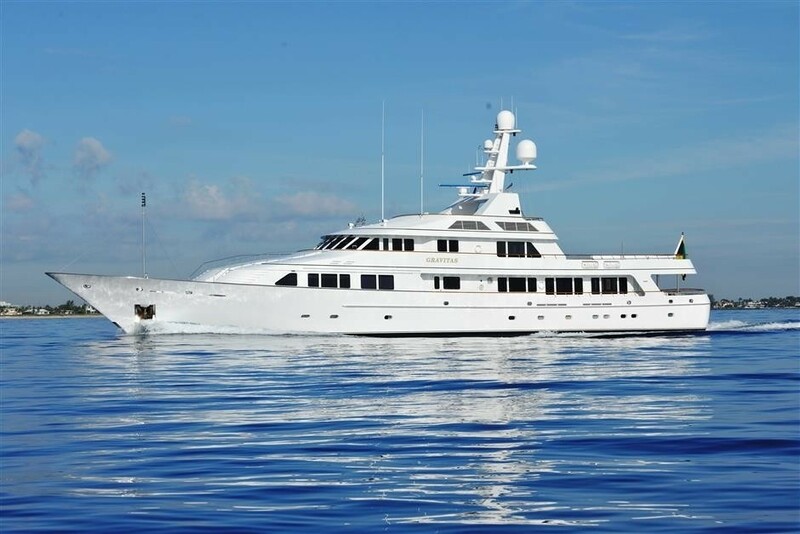 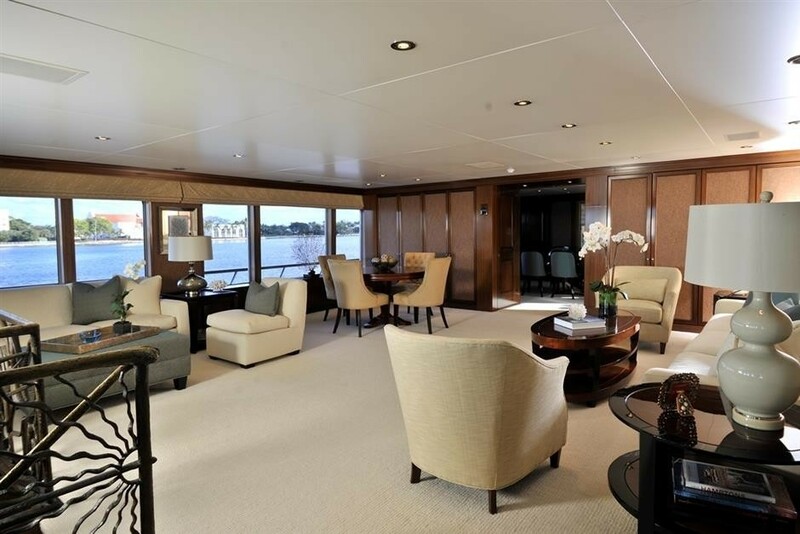 Privately she could accommodate as many as 18 guests, while under charter, a maximum of 12 guests. 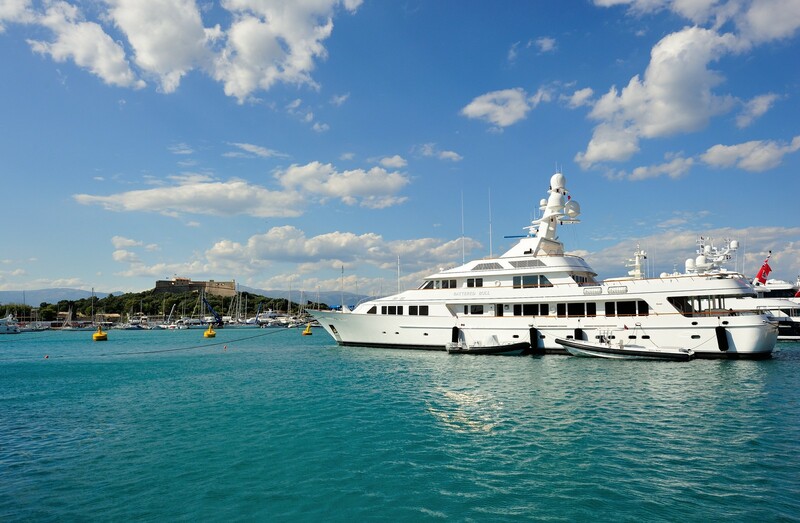 However the multitude of arrangements is advantageous when considering families with children, nannies, couples, security guards, pilots, other staff and more. 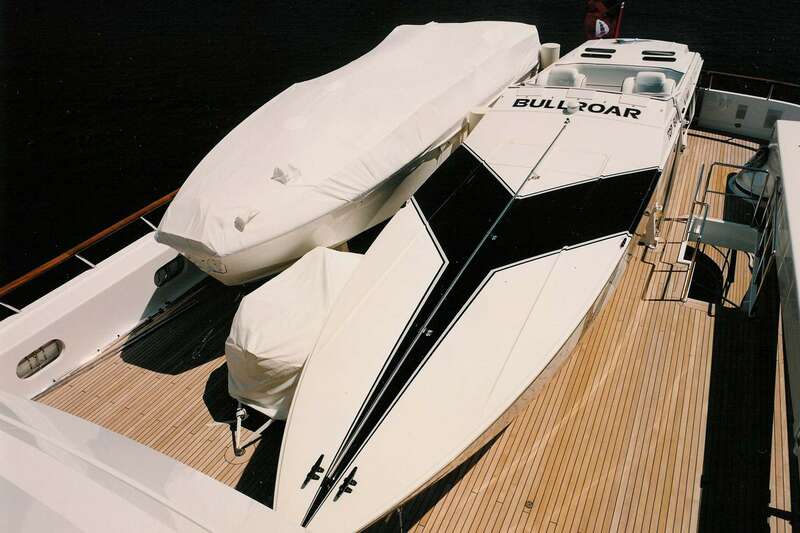 MARIA was previously called GRAVITAS and BATTERED BULL. 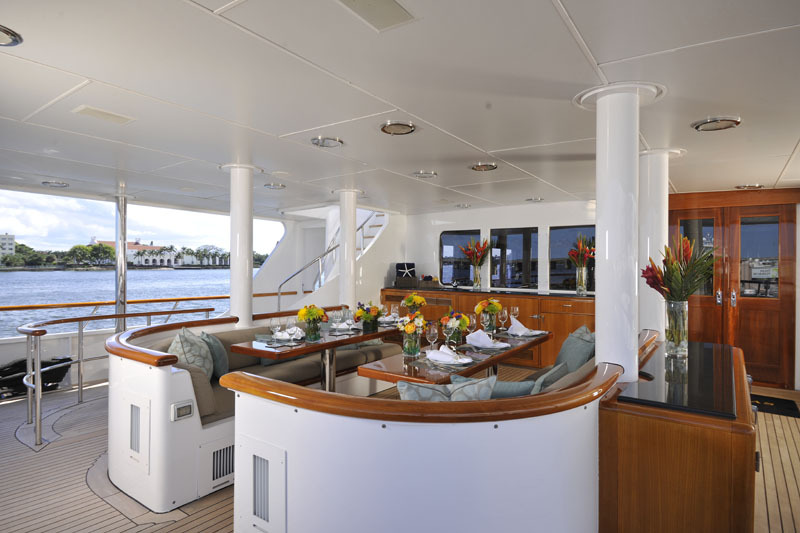 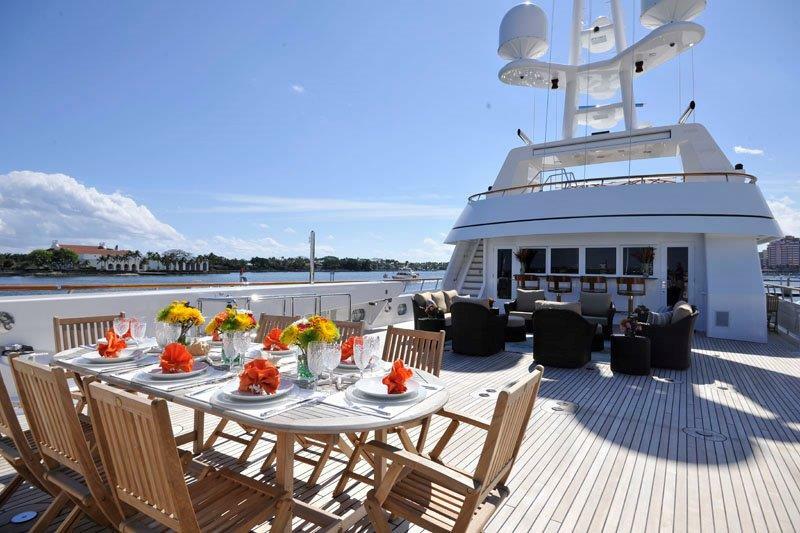 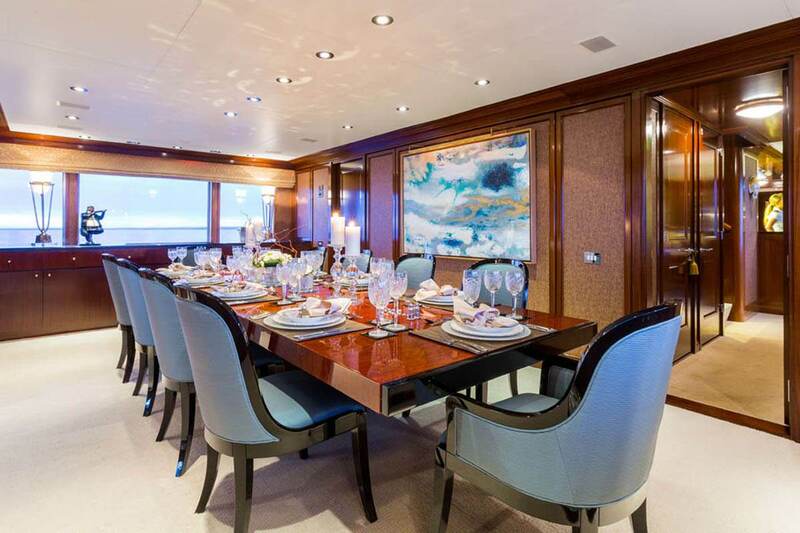 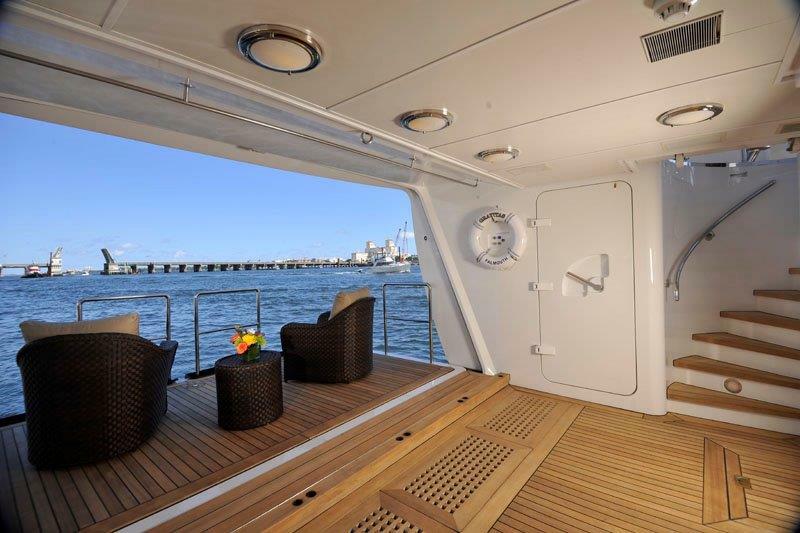 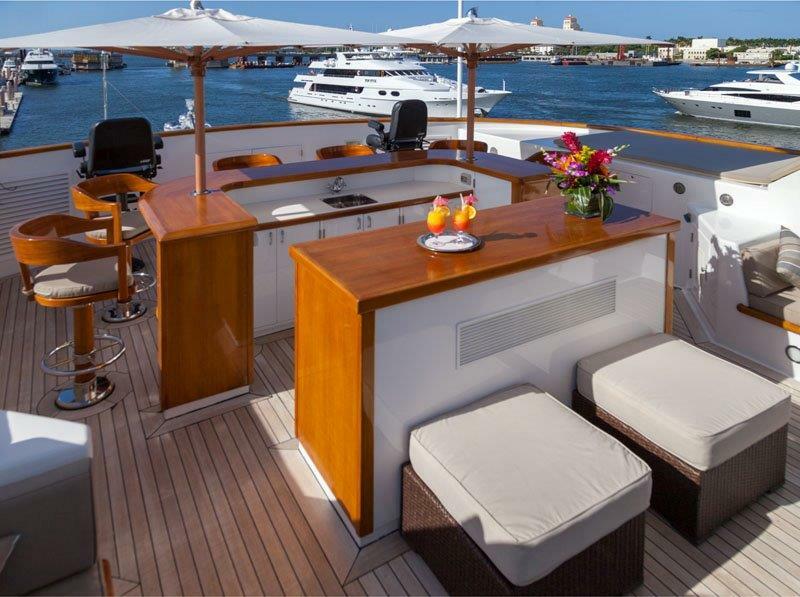 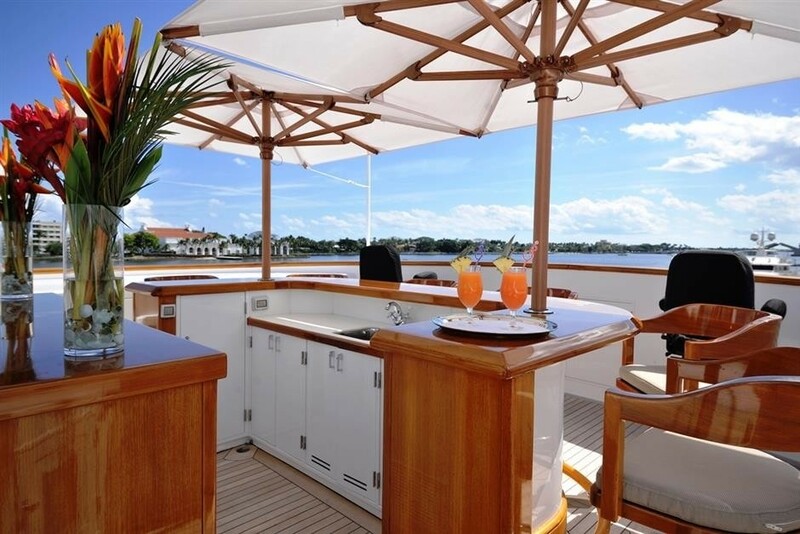 Boarding from the aft or side, guests enter the generous seating/dining area on the fully covered aft deck. 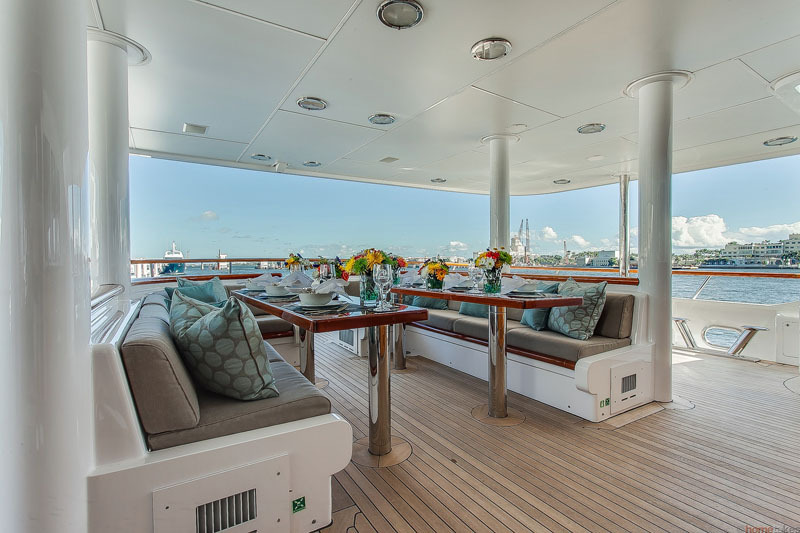 A U-shaped, convertible two table configuration allows for 10 guests comfortably while ease of service can be afforded by the central walk through of these tables. 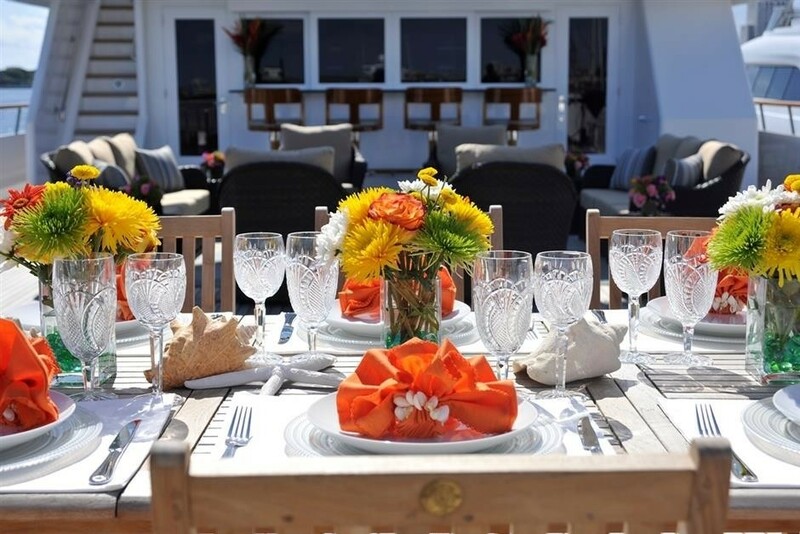 When the convertable tables are joined service for 12 is achieved. 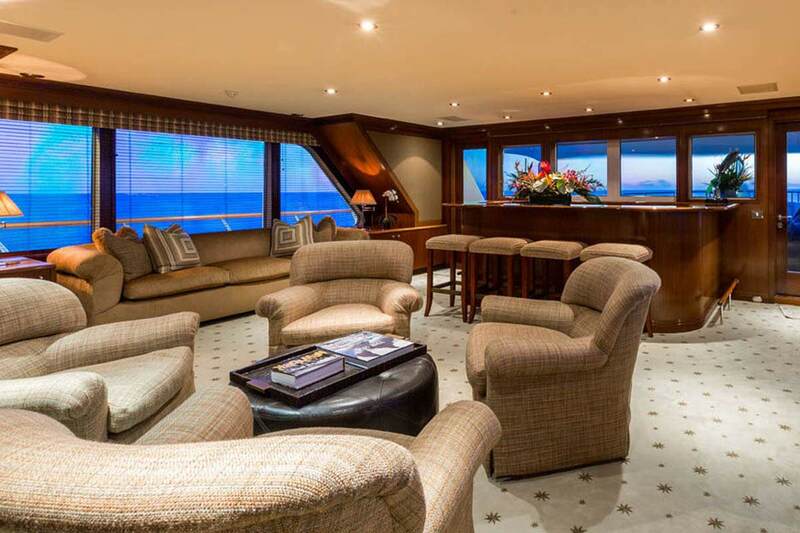 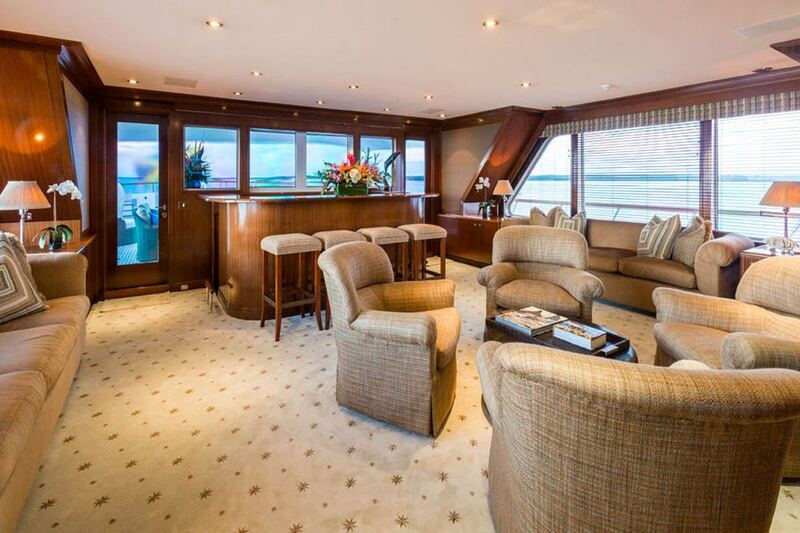 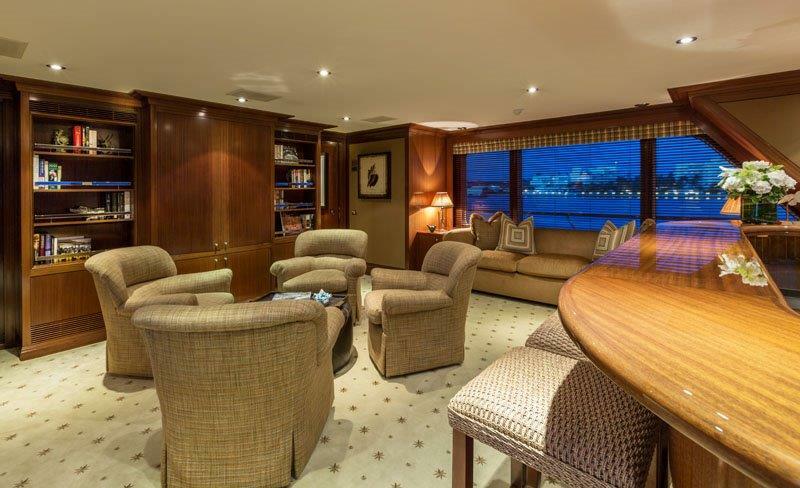 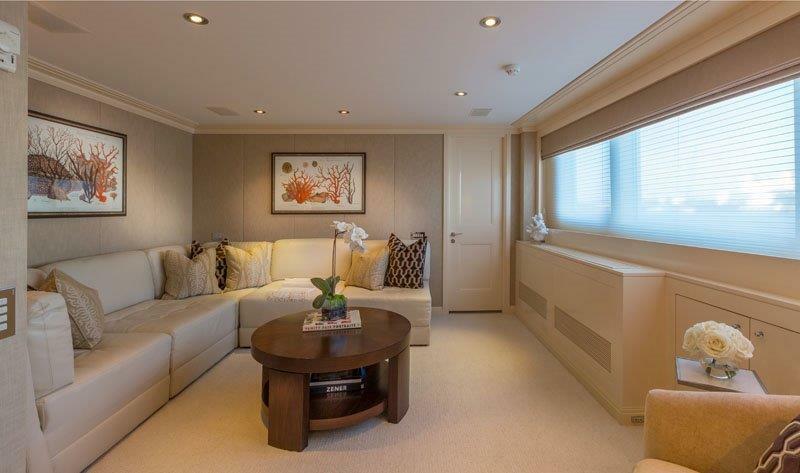 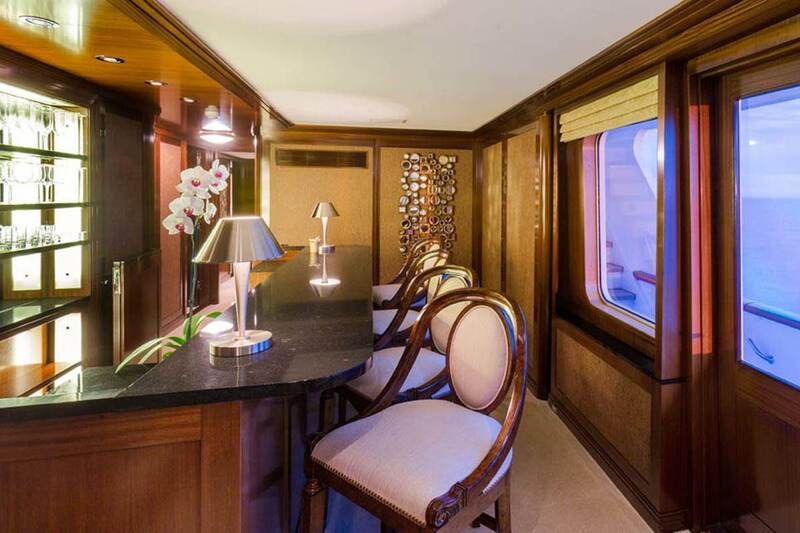 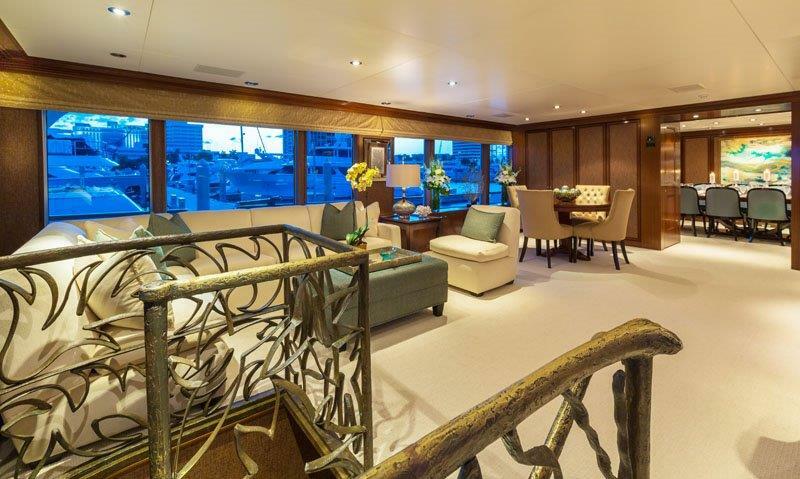 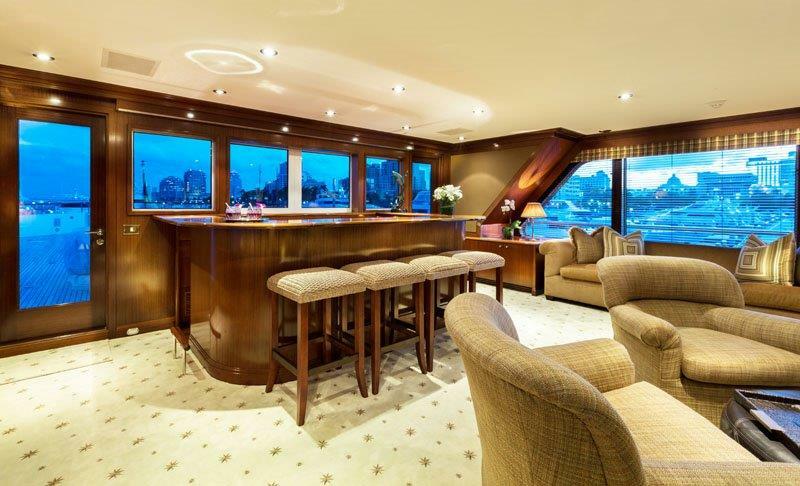 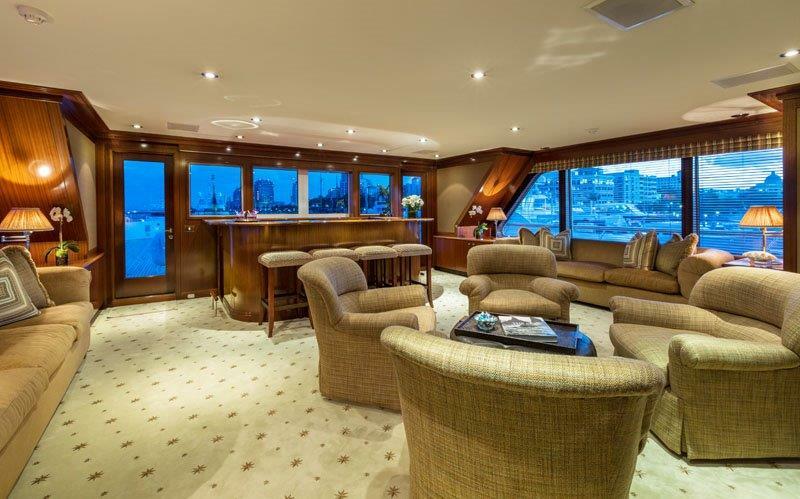 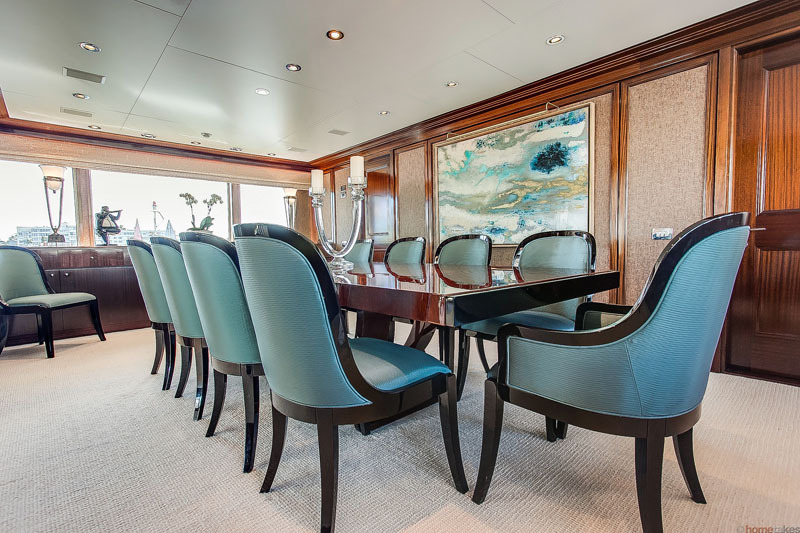 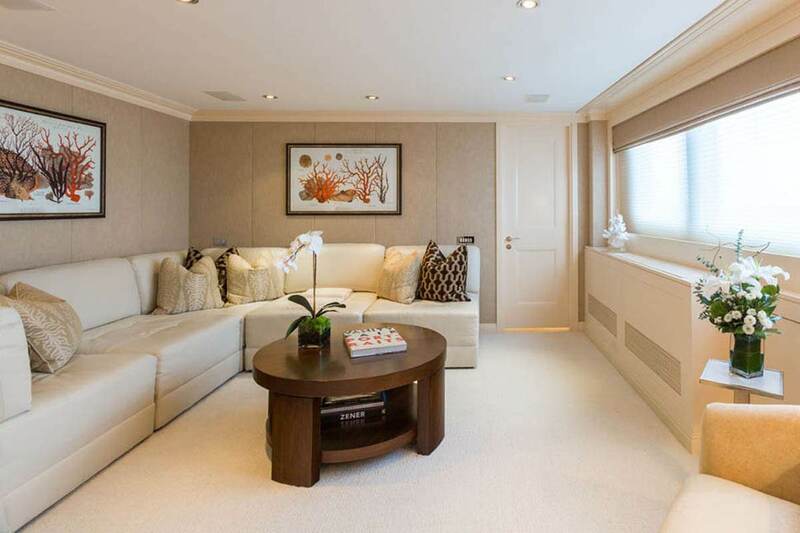 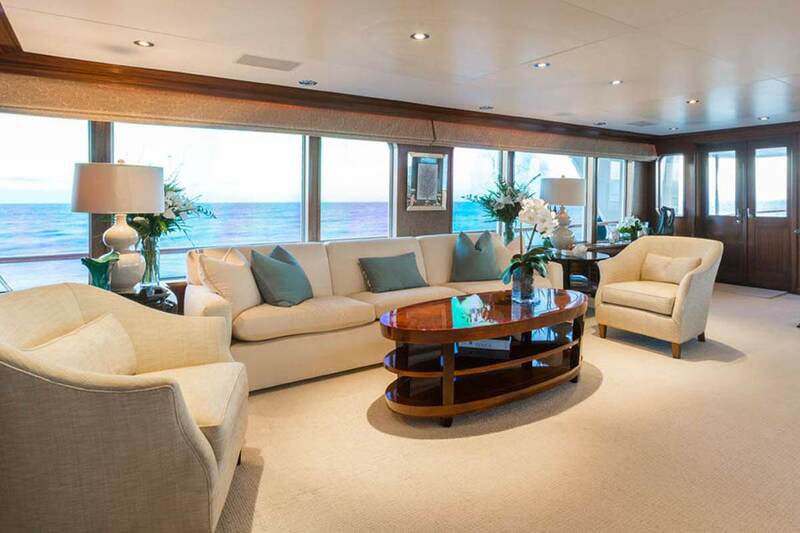 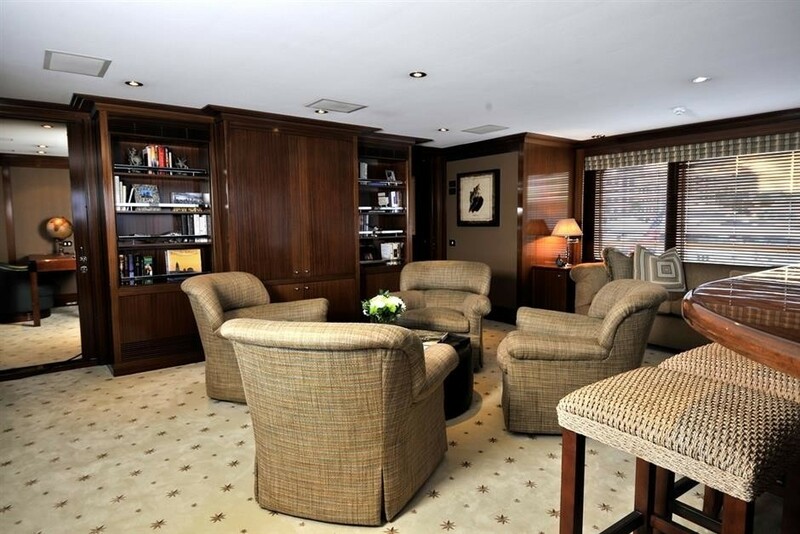 Entering the Main Salon, guests have a superb and vast area to socialize, relax or entertain with two full sofa seating areas - one to starboard and one aft to port along with a game table. 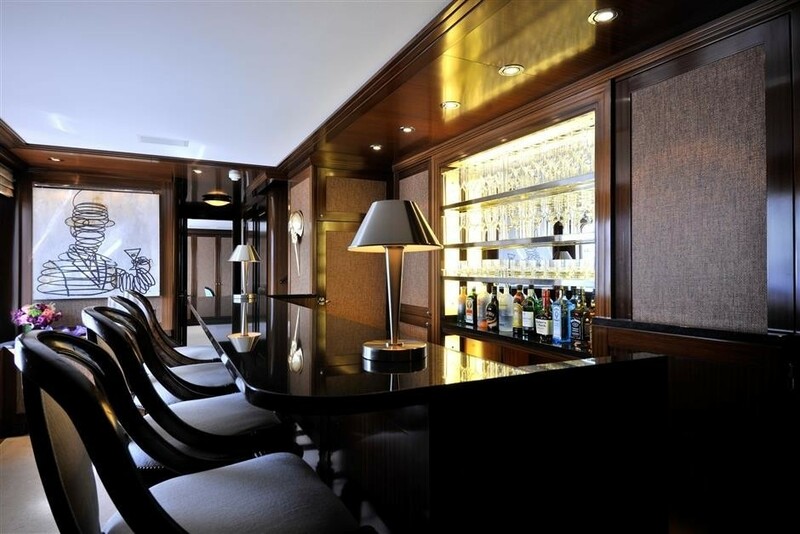 The guest accommodation stairs are located aft within the main salon surrounded by a beautifully sculpted railing which becomes a piece of modern art subtly featured in the room. 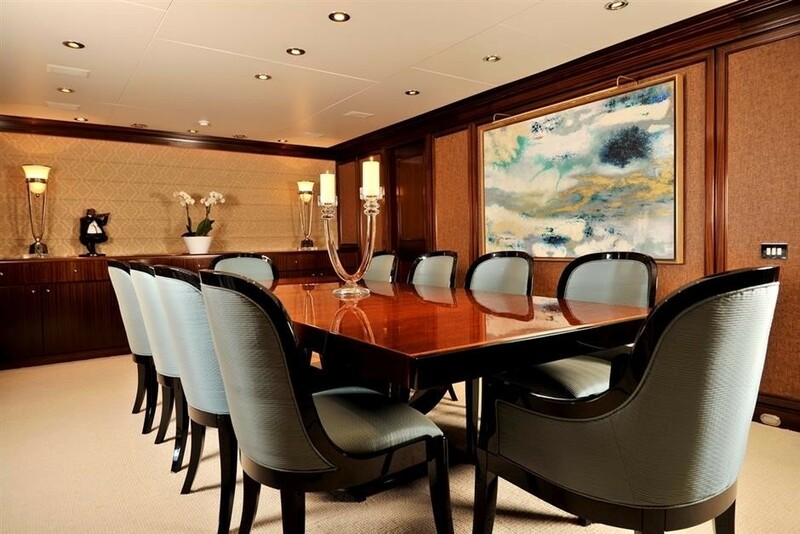 Forward of this is the separate Formal Dining room which can remain partially open to the Main Salon or privatized. 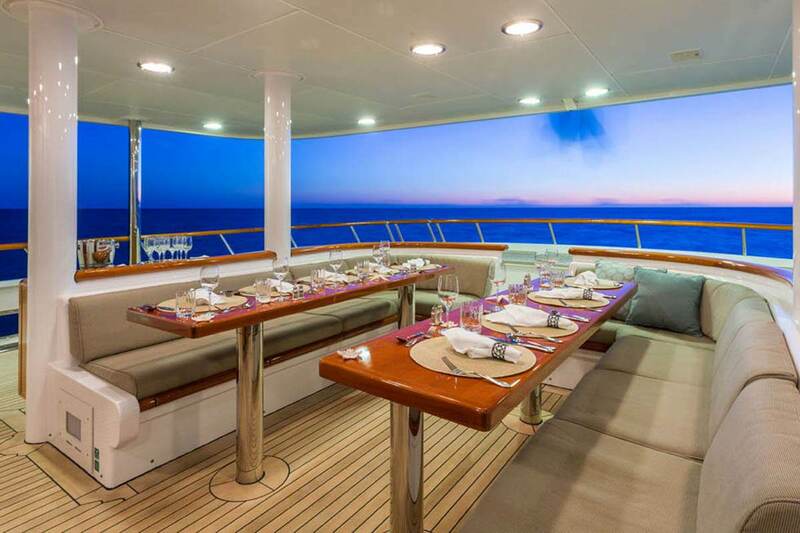 The table seats 10 or can be extended for 14 just as comfortably. 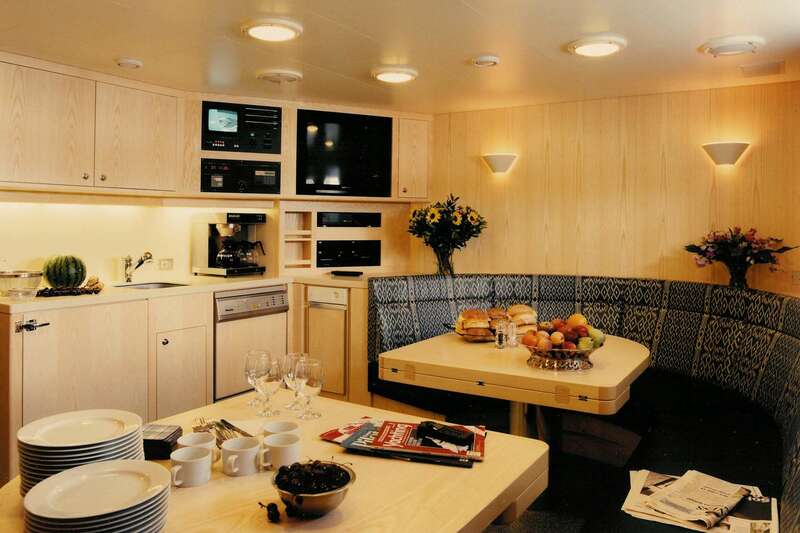 There is a dayhead located just forward of the dining area. 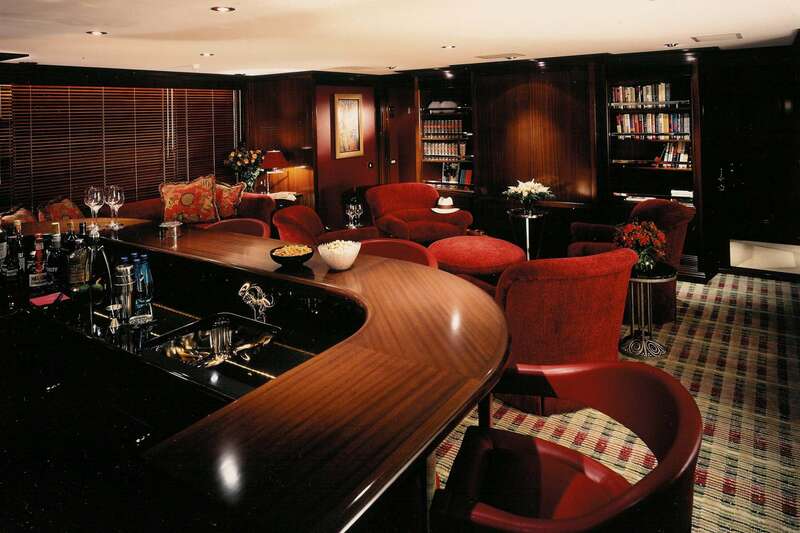 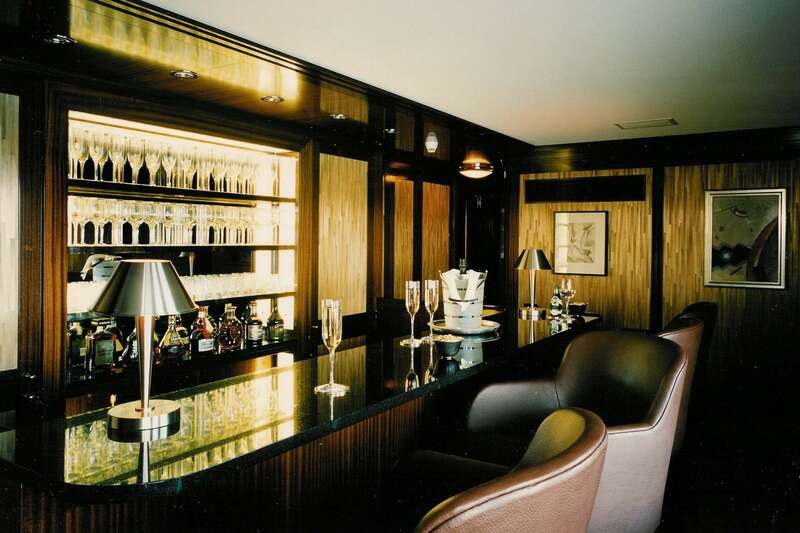 The Skylounge has so much to offer...whether used as a cozy place for movie night, privately curling up with a book or hosting cocktail hour at the 360 degree indoor/outdoor bar. 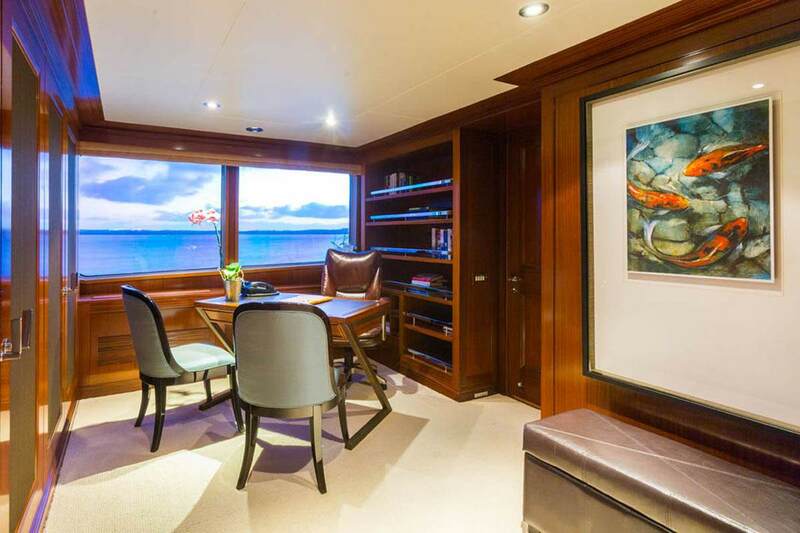 The spacious Guest Office is just forward to port of the Skylounge and features two desks with leather swivel chairs and computer. 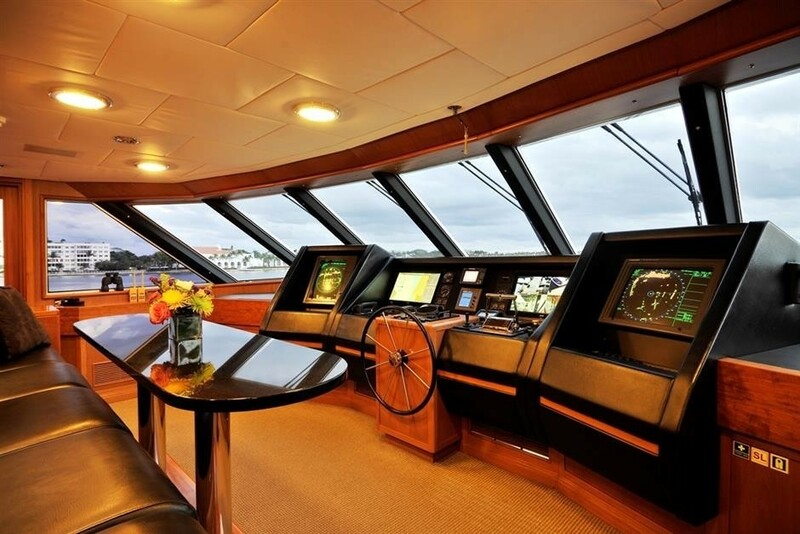 There is a dayhead located at the top of the midship stairs entering the Bridge deck. 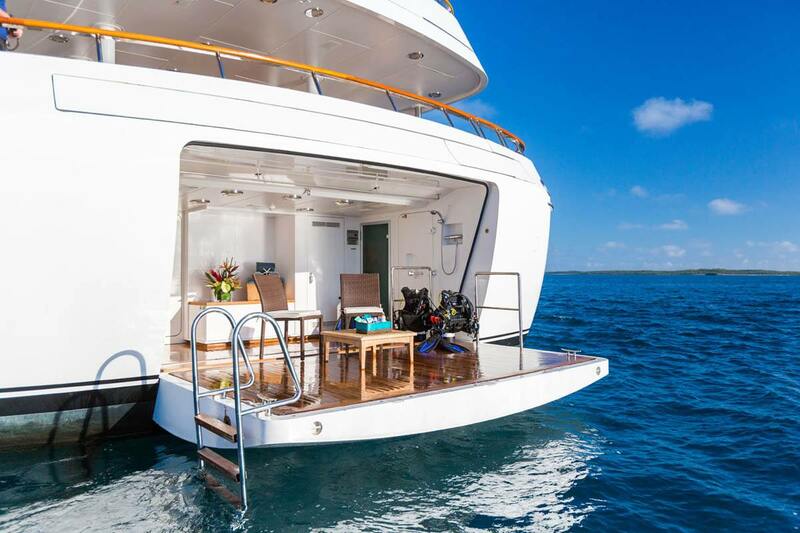 The largest exterior deck area on MARIA remains open to different arrangements is on this level. 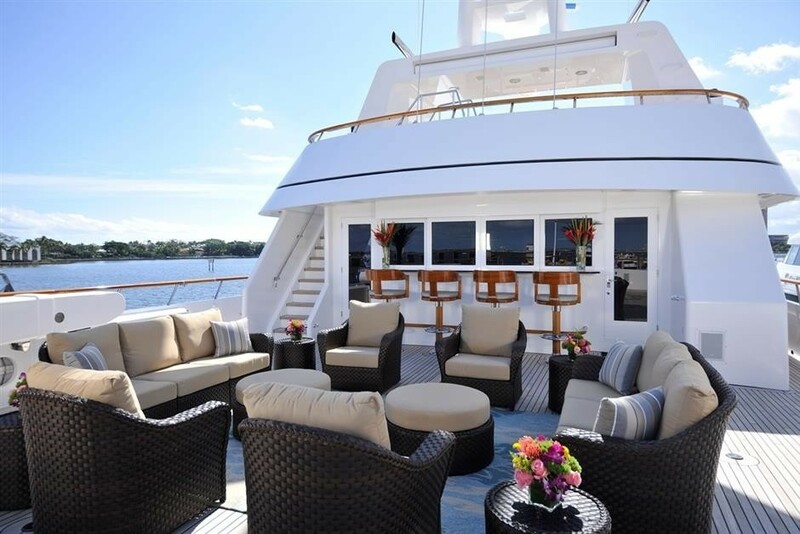 Guests may choose to socialize in the lounge, dine al fresco or take in some sun in chaise lounges. 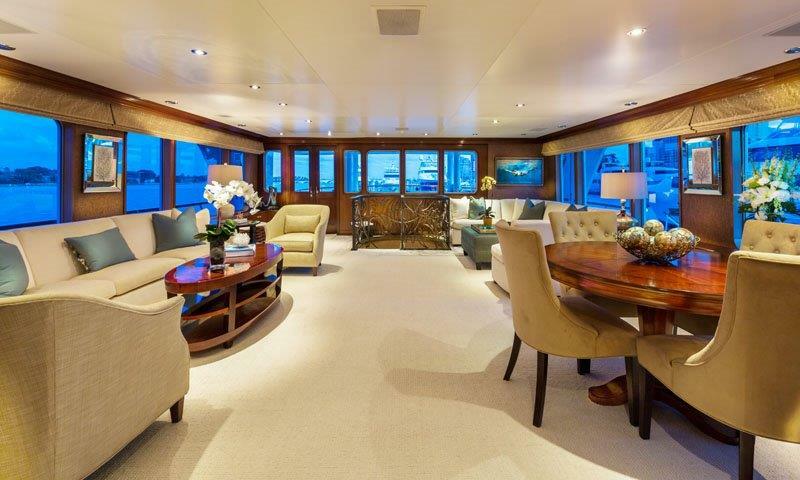 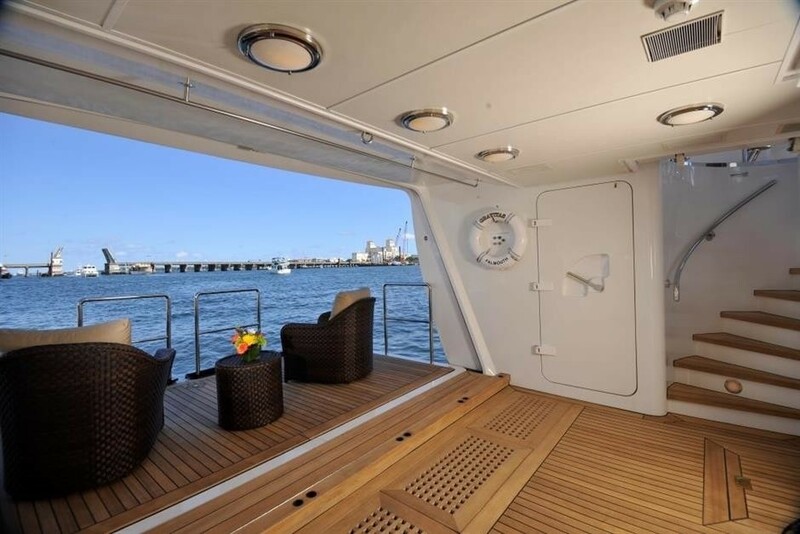 It is an extremely open plan, private, full beam (32' wide) use of space when all of the toys are deployed from this deck. 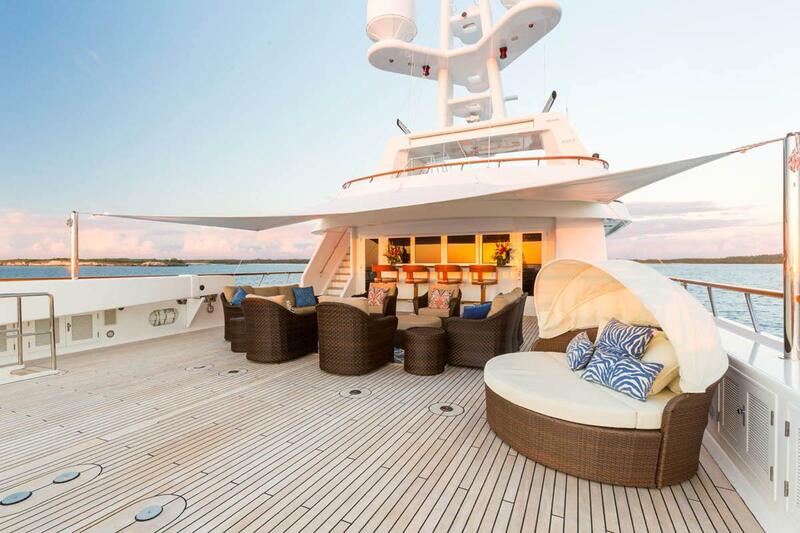 Up another level takes guests to what some may feel is the "best seat in the house". 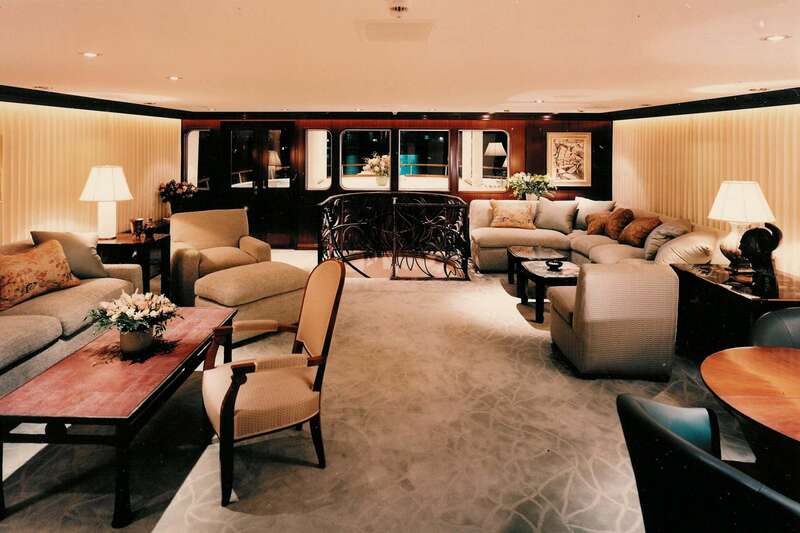 A cozier feel is accomplished by the layout on this level if this is what guests are in the mood for. 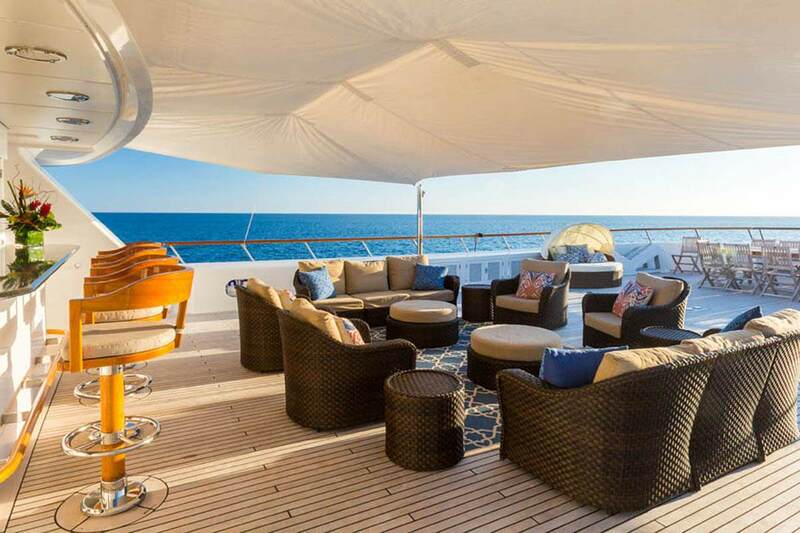 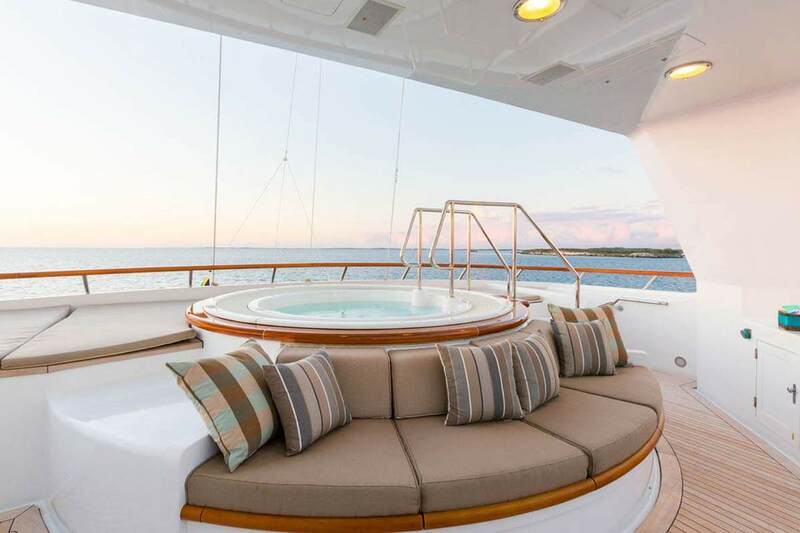 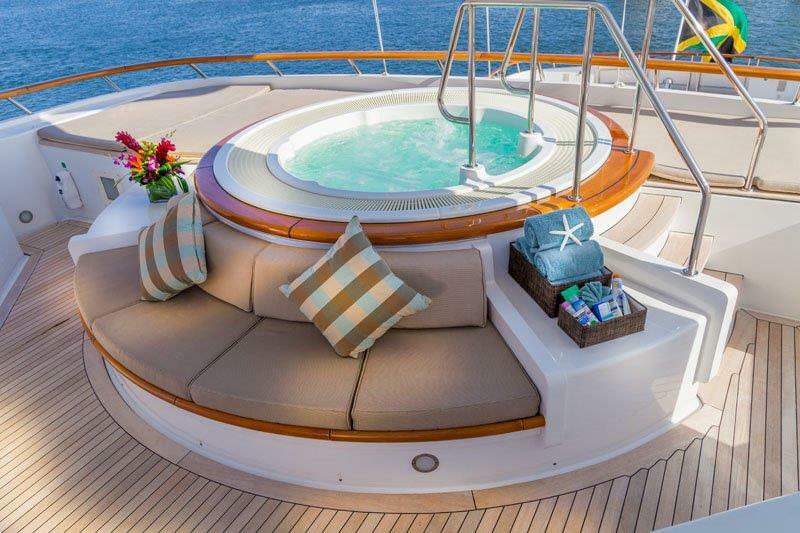 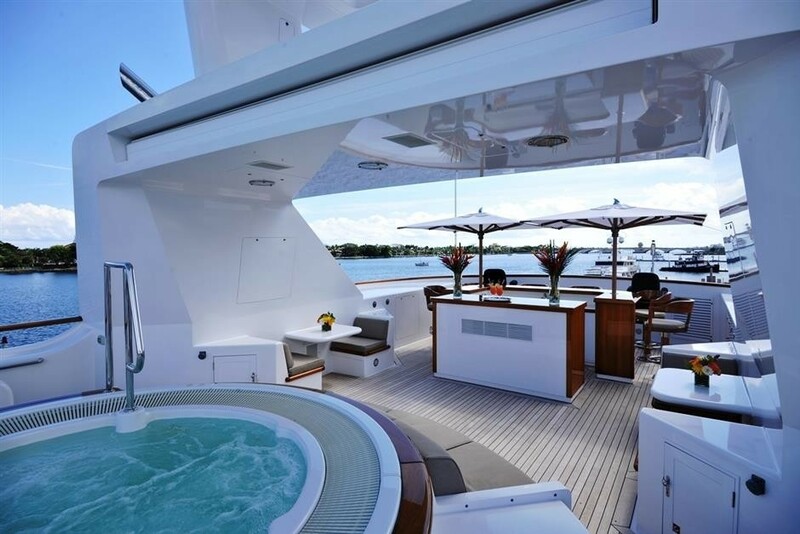 Aft is the 6 person Spa Pool, while guests will enjoy outstanding conversation and leisure area at the Sunset Bar with 6 swivel teak stools and shade if needed upon request. 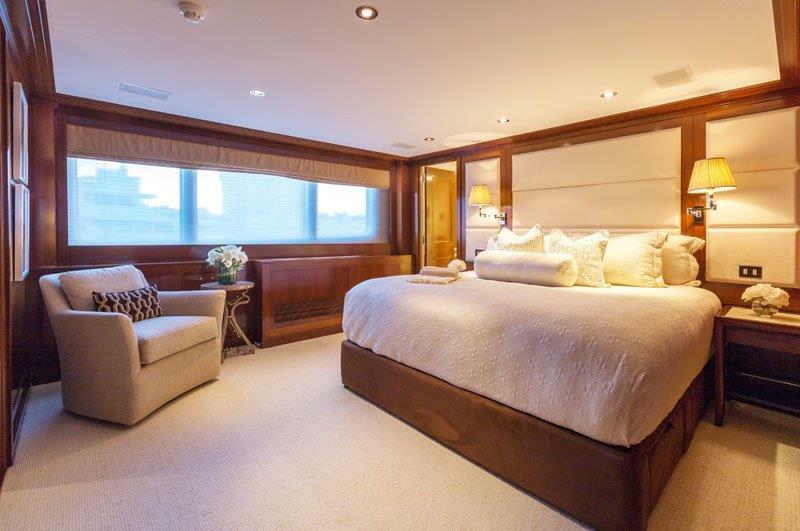 Master Suite (on deck) This unique "apartment suite" is comprised of 3 connected rooms and includes an intimate and elegant breakfast bar which…. 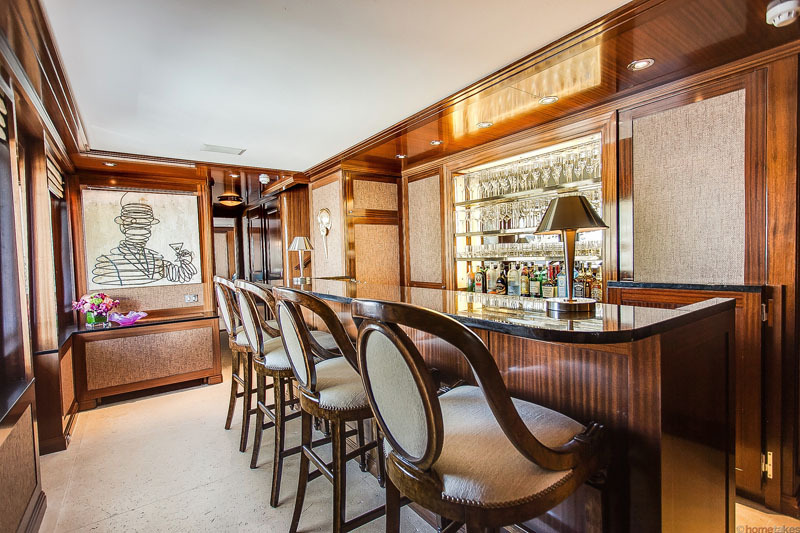 by evening turns into a private cocktail or after hours bar. 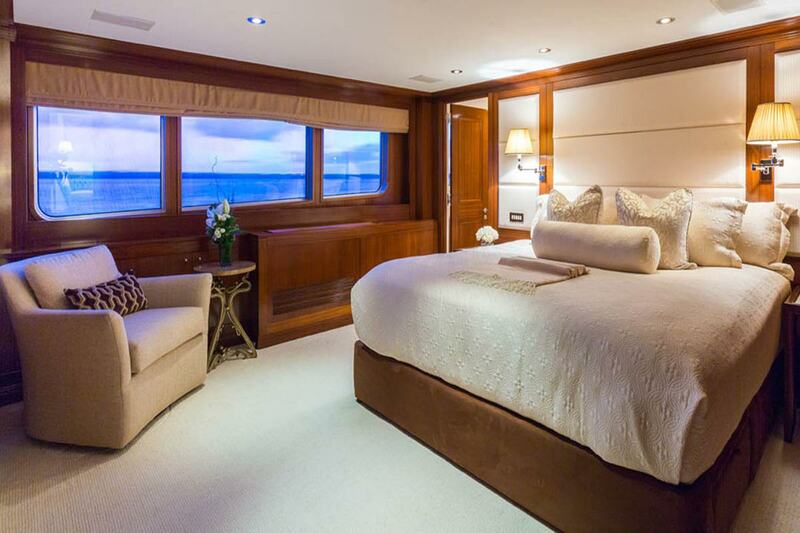 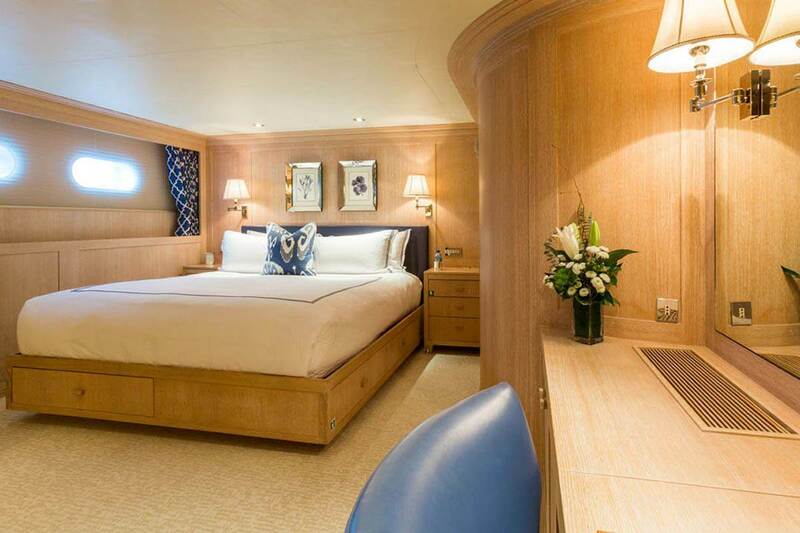 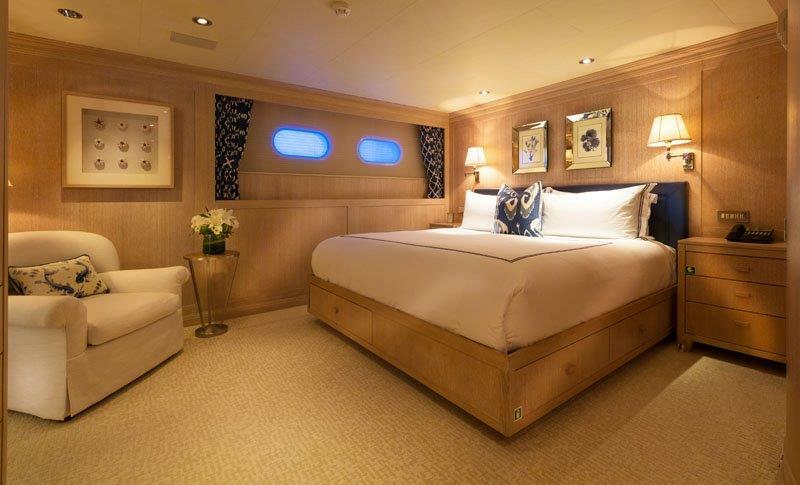 The King size bedroom is furthest forward to port while the private lounge, which may also be used as a child's room with two single beds, is across to starboard. 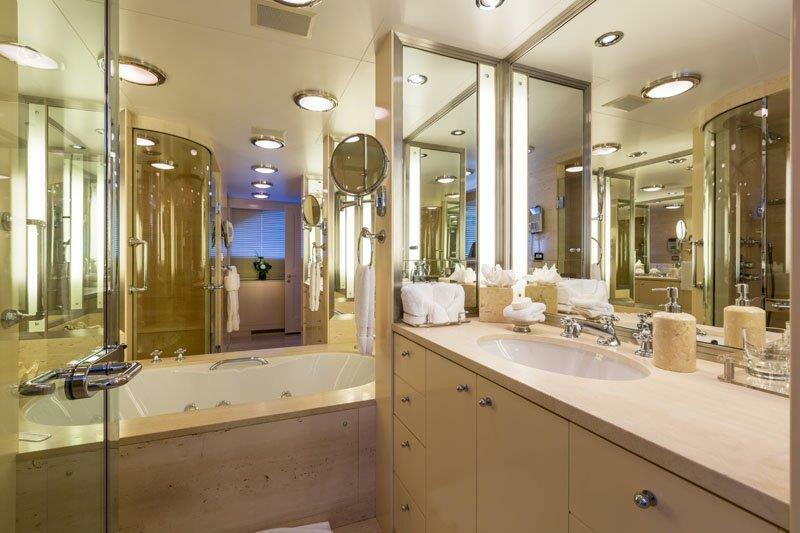 Both of these provide full ensuite use of the his/her bathroom including a 2 showers, central spa pool tub and separate toilets. 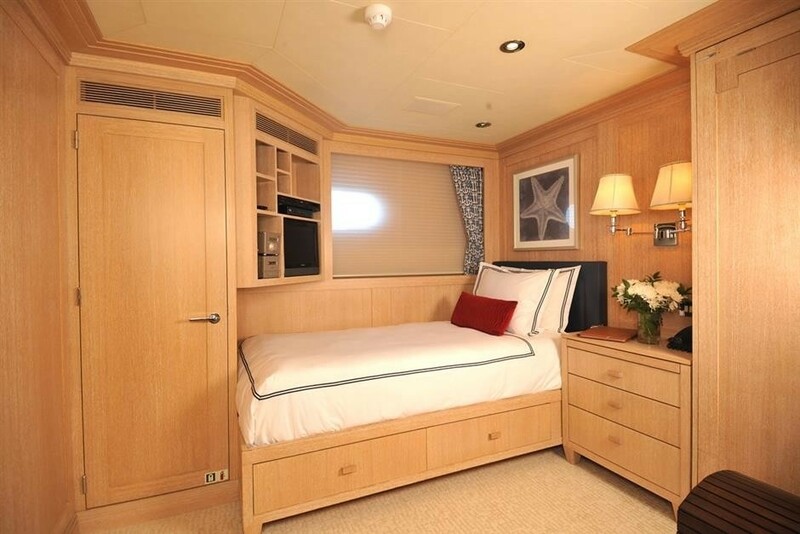 Connected to the bedroom on the portside with adjoining hallway access is the large walk-in wardrobe with private desk. 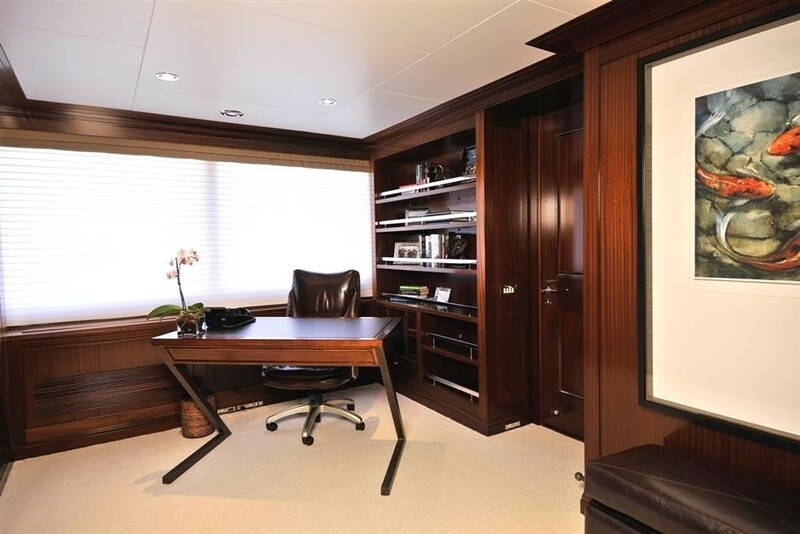 The substantial hanging closets and drawers are all concealed, offering the dual purpose of an Owner's library/office as well. 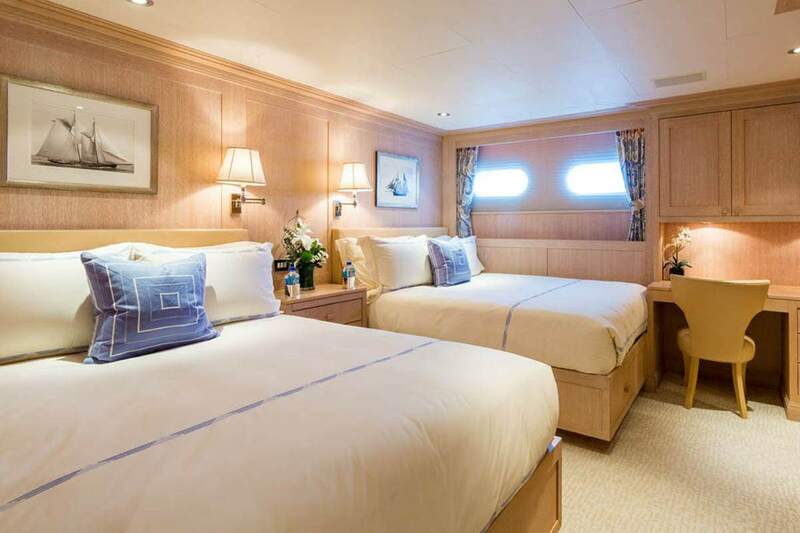 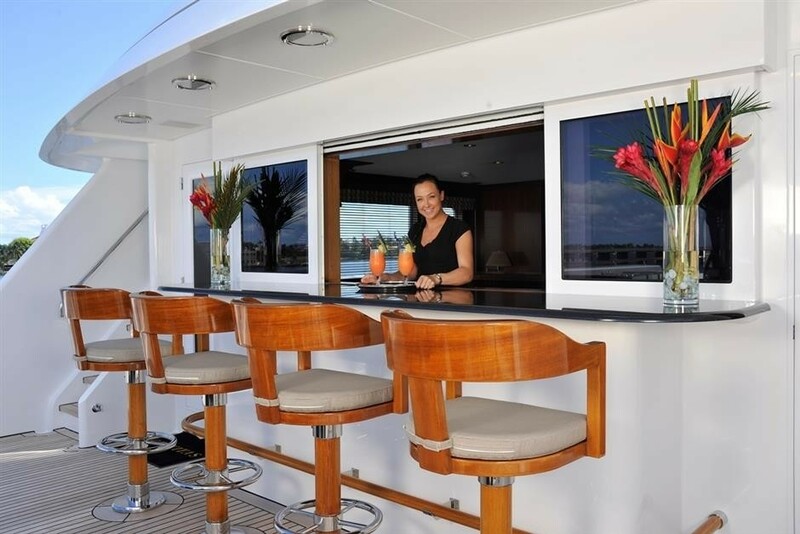 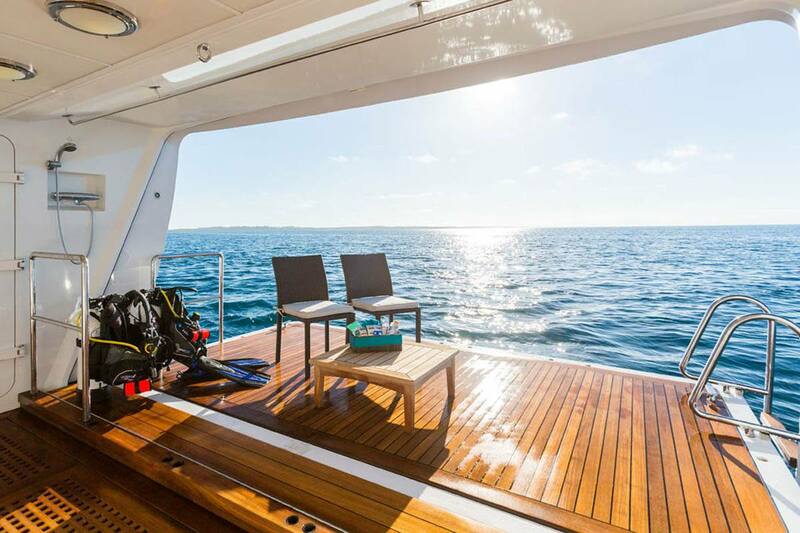 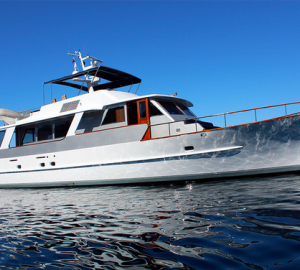 Below Deck There are 6 more spacious staterooms below with ample storage and fully equipped entertainment systems. 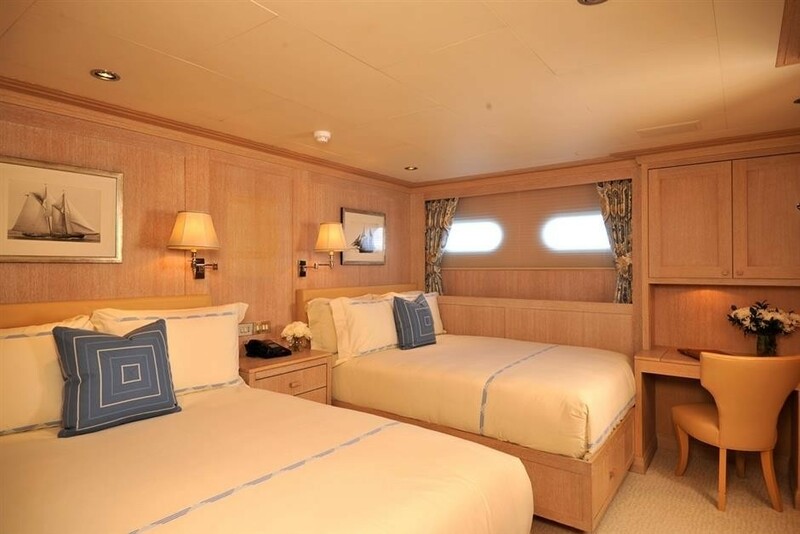 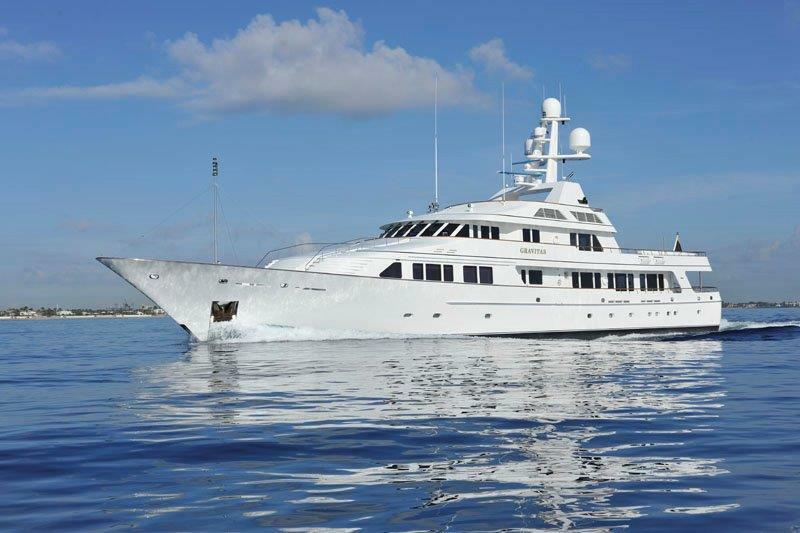 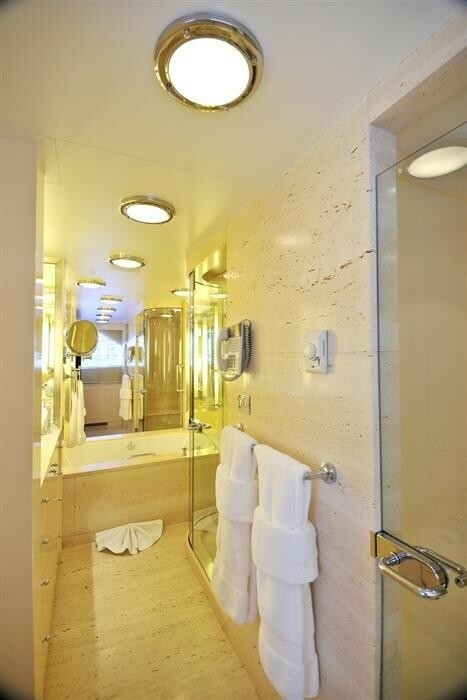 Furthest aft are 2 mirror image King staterooms each with a comfortable lounge chair, long vanity and walk-in closets. 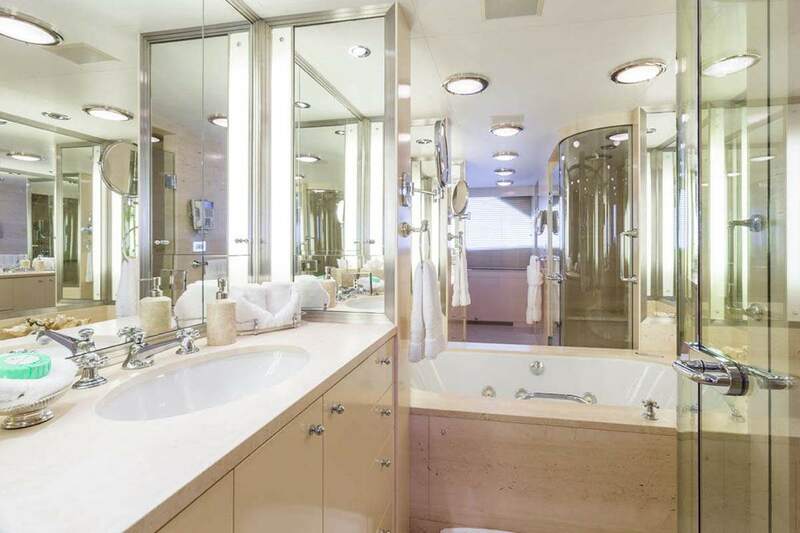 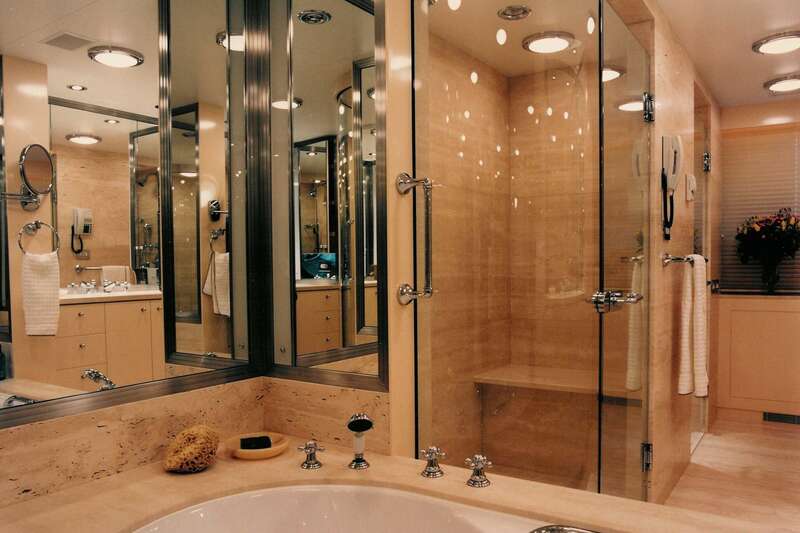 The bathrooms here include a Spa Pool tub/shower combination. Further forward are 2 mirror image Twin staterooms with two double beds rather than the typical Twin with single beds. 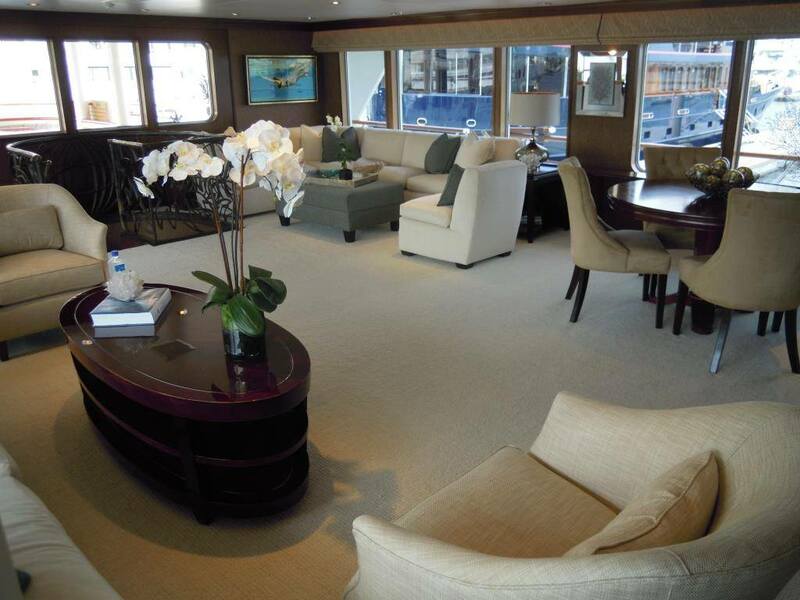 There is also still plenty of floor space for kids to play should these rooms be used by children. 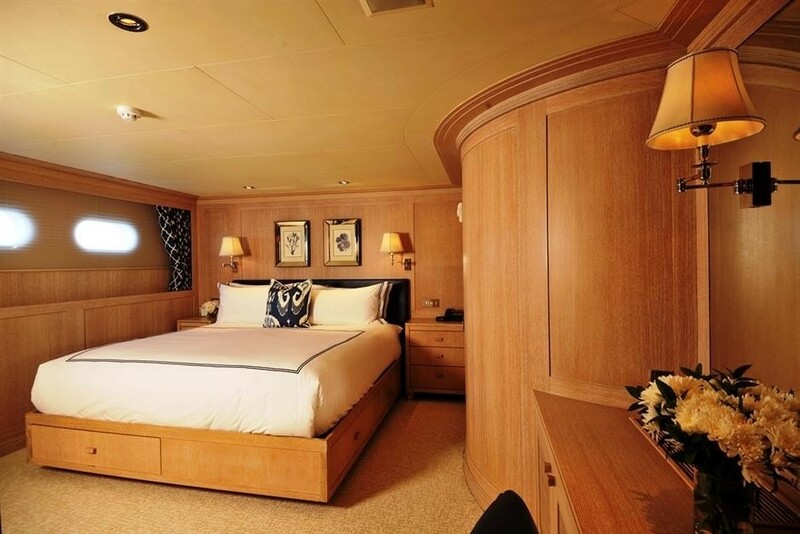 The forward-most single cabins each with Murphy beds, accommodating up to 4 guests can be privatized from the 4 aft staterooms in a combination of ways. 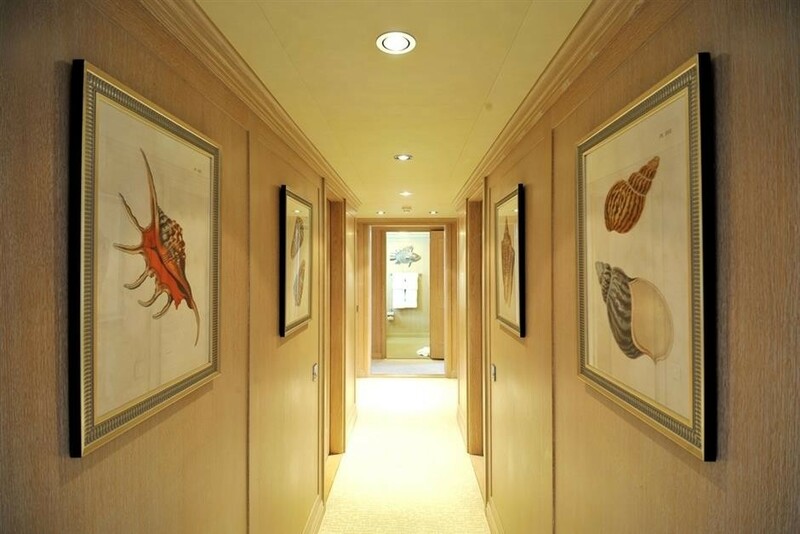 The foyer may close off the hallway entry completely forming a unique children's suite made up of these two cabins or left open they may serve as individual guest cabins with a shared central bathroom including shower.